Once your children can get around on their own two feet, walking with them becomes enjoyable and challenging in new ways. While you may use a stroller for younger kids, they will be able to build up stamina for walking for longer times and distances. Walking with your children and setting a good example of doing regular exercise is critical in preventing your child from becoming a lifelong couch potato. Childhood obesity is epidemic in the U.S. and other developed countries. Television, computer and video games and other screen time contrive to keep them inactive. Fears of stranger danger and lack of good pedestrian paths also make parents afraid of letting their children walk to school, the store, or the playground. While 89 percent of the children who lived within a mile of school walked or biked to school in 1969, only 35 percent did so in 2009. Children of ages 6 through 12 need 60 minutes per day of moderate-to-vigorous physical activity for good health. That is the equivalent of 12,000 to 15,000 steps or 5 to 6 miles. 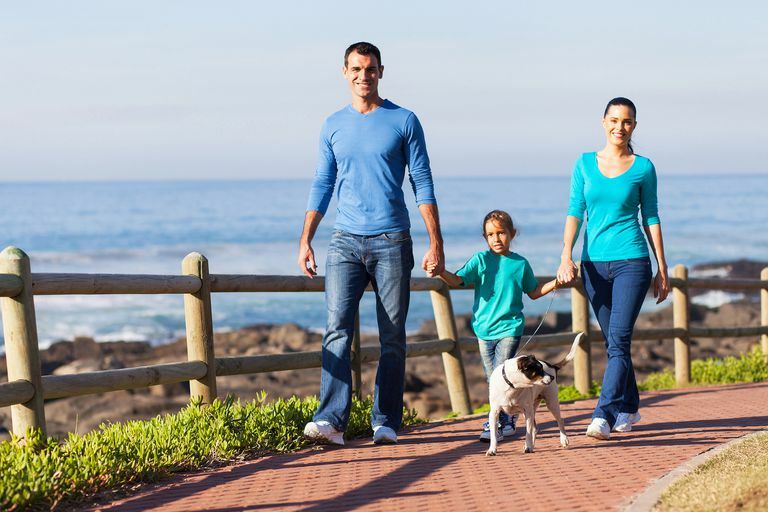 Family walking time: Set aside a family walking time, preferably for a half hour to an hour, three or more days a week. This will help you achieve the suggested amount of physical activity per day for both you and your kids. Dog: Get a dog that requires being taken for a walk one or more times a day. Walk together as a family or rotate turns in taking the dog for its walk. The dog will provide protection for older children who may walk the dog alone, reducing stranger danger. Walking events: Spice up your walking by entering walking events such as charity walks with your child. Your child will have the thrill of earning medals, t-shirts, etc. for being active without competition. Turn wait time into walking time: If your child is in organized sports, use the time between dropping them off and picking them up to get in a walk for yourself, either alone or with your spouse or friends. It not only ensures you get some exercise in your busy day, it sets a good example for your child. Pedometers: Children love having a pedometer or fitness monitor to count their steps. Make step counting into a game and have them keep track, or guess how many steps it will be from home to the playground, etc. Fitbit and Garmin both have devices designed specifically for kids. Pokemon Go: Many families stroll while playing this virtual reality game. Kids love catching Pokemon with their parents and grandparents. It's a great excuse to visit local parks where there are more Pokestops. The app gives walking goals of 2 kilometers (1.2 miles), 5 kilometers (3.2 miles), and 10 kilometers (6.2 miles) to hatch eggs for new Pokemon. Explore nature: Take along guidebooks for flowers, trees, birds and try to "bag" new examples on each walk. Maps: Give your child the map (either on paper or the one on your phone) and teach your child how to read maps, identify north and south, and navigate. Encourage your child to draw a map of the route as you go along. You can use a mapping app on your phone and show your child how to use it. Rewards: Plan rewards along the way. Make your turnaround at a store or market where you can buy a healthy treat such as fresh fruit. Bring along treats or prizes to give at milestones along the way. Keep it Interesting: Include playgrounds, streams, parks, and other points of interest on your walking route. Sports watch or walking app: Get your child a sports watch and encourage your child to track the time, distance, splits, and play with the stopwatch function. Question of the day: Use the walking time to really get to know your child. Have a question of the day to explore beliefs, values, and talents. Variety: Plan for variety. Adults may be happy with the same route day after day, but children are more easily bored. Change the route through the neighborhood, see new things. Games: Try playing walking games. These can be similar to the games you would play in the car, such as I Spy. But you can also include active games such as Follow the Leader, or playing catch as you walk.